Chiltern Charcuterie sells both to retail and trade. We are happy to work with all parts of the food service market including restaurants, wine bars, farm shops & Delis. 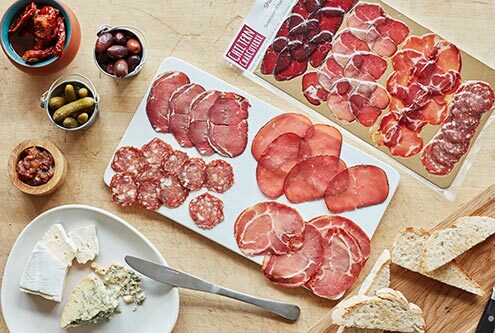 As well as selling direct to consumers online and at local farmers’ markets and food festivals, we also sell our range of award-winning charcuterie to the food trade. Our products are stocked in delis and farm shops, and being used in wine bars, restaurants and cafes across the south east. Selling to trade has been an area of the business that we have invested heavily in since starting, and as well as providing the finest charcuterie made by hand from free range animals, we also ensure that our customer service is of the finest quality too. We provide additional point-of-sale materials and are always happy to take part in tasting days or providing samples for your customers, please get in touch to find out more. We can tailor our packs specifically for your chefs so as to reduce the amount of wastage, increase your profits, and deliver to your staff and customers exactly what they need. Interested? Why not take a look at our ready-packaged mixed platter board products? Do you run or own a pub or local restaurant, either here in the Chilterns or beyond? 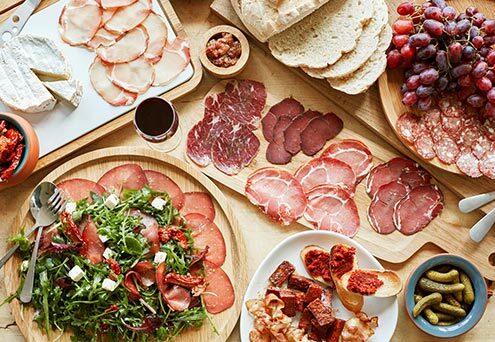 Do you offer, or are you hoping to offer, cured meat platters as part of your menu, the perfect sharing starter for a couple or two friends? If so, why not try our Mixed Platter packs, a cost-effective and low-waste way of serving award-winning charcuterie to your customers. We also offer a Premium Platter, which is as above but includes cured lamb or venison instead of the pork loin. We now have a network of trade partners in London and the South East, but we are looking to work with more. For our retail trade partners we provide a complete pre-sliced and packed range of produce with supporting point of sale materials. We are always happy to provide trade samples and tasting days for your customers. For the food service and restaurant market we can provide whole and chefs packs that are pre sliced. Chefs packs can be tailored to your specific serving requirements ensuring you minimise waste and maximise profit. Again we are happy to provide tasting samples and a tasting event for your customers.